There are many different patterns of hair loss. The one that may affect you will most likely vary depending on genetics and not anything you would or could do throughout your life. The top hair transplant doctors quickly recognize these different patterns and in doing so can predict with fairly good accuracy how the pattern of hair loss is going to continue and to what degree. Using this knowledge, expert hair transplant doctors like Dr. Bernard Nusbaum of Miami can create a game plan for “reversing” the balding with living growing hair. This hair loss patient of Dr. Bernard Nusbaum had completely lost his hairline and the pattern was progressing back toward the crown of his head. 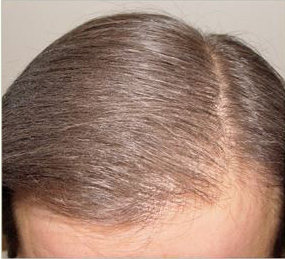 However, as you can see in the photo, his patient did have some thicker natural hair about 4 inches behind the hairline that was hanging on rather well compared to the front. So he decided to focus the hair grafts into the hairline and front in an almost “D” pattern. But he noticed a bit of a problem. 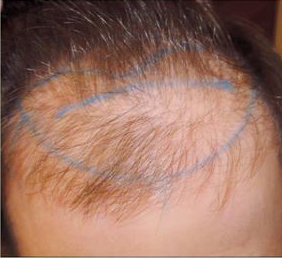 While the patient had some very good donor hair the fact of the matter was that each hair was thin. That is to say, the caliber of each hair was rather skinny and that made producing a cosmetically thick restoration more challenging. You see, the thinner the hair, the harder it is to get coverage. And the more you try to get coverage with thin hair, the more unnatural it could look. It is a delicate balancing act which requires experience and lots of forethought. To address this Dr. Nusbaum decided to break his procedure up into two visits. The first was to lay down the “foundation” of the new hair, and the second would be to thicken it up. and made sure to pack them densely, but not too dense that it would affect the overall growth. By using strategy and patience Dr. Nusbaum and his team struck the balance necessary to give his patient a NATURAL hairline that BLENDED with his original hair. Now his patient may go swimming, walk in a strong wind, or just get a regular haircut without concern. All thanks to the expert ability of Dr. Nusbaum and his Miami hair transplant team. Before/After hair transplant with Dr. Bernard Nusbaum of Miami.